Blue & White is an original and quirky shop in Tokyo presenting the best of blue and white handmade crafts to Azabu Juban and the world for 35 years. Indigo and sashiko, yukata and tenugui are carefully chosen to highlight the beautiy of the blue and white traditon of Japan. I loved your post on the blue and white calendar and wondered if is possible to buy one by mail order as I am in Australia. Me too. Brilliant blog , marvellous shop. Very inspiring. As the song goes, “you give me strength . . . to carry on ! So glad you like us. It is exciting to be reaching out in this new way and your response makes it that much more worthwhile. New one coming soon, this time about beautiful dyeing. GREAT SITE! Just like your shop! Wow ! How did your nice comment miss our attention? We LOVE that kind of remark. Sorry I have been slow to blog recently. I will get back in the blue and white groove again. There is so much in Blue & White, so much in Japan that I want to share. I have just come across a copy of Blue & White’s little catalogue booklet which I kept from 1987 when we used to live nearby. Like your 2012 Calendar, it comes with a splash of red, bound with red string: that makes a 25 year cycle! Wondering if B&W was still in Azabu Juban I googled you and here you are! Delighted my favourite place is still as interesting as ever. One of these days I will get back to Japan and be sure to revisit. Good to hear from what sounds like another long stayer in Japan. Am I right? Once it is set it won’t run. Color just gets deeper. How about kasuri or machine made sashiko? You want the material to be pretty strong and dark helps on dining room chairs, I find. Unfortunately we do not have an online shop. Why not just come us and see us? Hi Amy – yes, another “long termer” here. 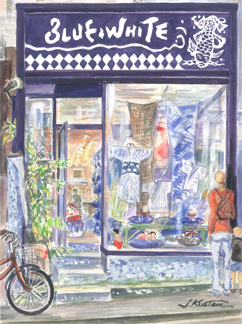 I do adore indigo, and that’s why I thought of your shop. I will actually be in Tokyo on Monday, August 6th, 2012. I will try to visit you in the afternoon. I am only just seeing your email now, and I am afraid I wasnt in the shop on August 6, but someone was. But if you are a long termer, maybe we can count on your coming in again in the near future. Do you have an email address we can contact the shop on as I would like to preorder some items? I wonder why they bounced back. And you can also catch me here. Love the concept; cannot wait to visit in person! I’ve just stumbled upon your blog. I’m not sure if you remember me, but I lived in minami azabu way back in 1998-2001. Our first son, jasper was born there, and as a babe in arms, I used to bring him in for my Monday quilting classes. We came to Tokyo March last year (a few days before the earthquake) and I popped into the shop, but you were at a wedding! Wonderful to hear of your fortuitous stumble. Of course I remember you – and Jasper coming to quilting classes. Sorry I missed you in March, but come back soon and I’ll be sure to be waiting. I’m thrilled you remember us!! We are now in Singapore, but had quite a few moves between Japan and here!! HK x2, America, Melb (for SARS) and Sydney!! We are thinking about skiing in Nagano again in jan. if so, I’ll def’ly pop in! hello—i am interested in buying some of your gorgeous calendars. i have emailed a couple of times but have not heard from anyone. help !!!! I have taken several sashiko lessons and love the sensei. Is there any way she might want to teach some of her other quilting/ needlepoint skills. She showed some examples today and they were simply beautiful! If you ever go to the Netherlands, I’ll be happy to show you the beautiful city of Amsterdam and I am sure that you will enjoy the “Delfs blauw”. What a blast of energy you and beautiful little Maxima brought to Blue & White ! and your magic house in the garden – some day I will come to see it. Happiness always with that beautiful family and those beautiful dreams of yours. What a magical store with such warmth and friendly service. Loved all the items especially the calendars, cards and tableware. Would love to find your things online in future ! You brought such brightness on a rainy day! You point out new directions. Forward to the future ! Amy, you don’t know me, but I loved your shop when I lived in Tokyo in the mid-’80s (’85-’87). I loved it so much that my Japanese cousin bought some items there for my Berkeley wedding in 2003: a set of blue-and-white cloth coasters; two blue votive candles with white designs (one of a dragonfly); four white porcelain, cherry blossom-shaped “hashioki with blue accents; and five delicate porcelain spoons—maybe for chawanmushi?—each with a different blue-and-white design on the handle (I love those spoons, although one has since broken, alas). I hope to visit your shop again in person one day and am happy to learn you are still in business after all these years! When I was lonely in Tokyo, it was a comfort to browse your lovely wares. Thank you for sharing the beauty and tranquility of aizome with the world. Your encouragement is empowering even after all these years. Do come back and we will present you with a new spoon. The tranquility is still here. Bonjour. Bientôt au mois de mai je visite le Japon. les magasins de tissus sont très difficiles à trouver. Pouvez-vous m’aider? A Tokyo et dans les grandes villes ?